The Case of the Disappearing Posts Continues… – Ce Soir Arts – Be inspired tonight! It seems that my longish – and quite well-written post (if I do say so myself!) regarding this past Sunday night’s wonderful show at Ce Soir has vanished! I didn’t delete it (I mean, really! Who on earth would delete some of their best work, ever?!). Aeon swears he didn’t delete it. So…what happened to it? Is there a post-ghost lurking about? Was it…YOU?! Not likely, I know, and I am sure it must have been my fault; after all, I am the chief writer around here. I can’t quite sort it, but am trying! I’ll keep you – umm – posted on progress. In the meantime, you MUST have at least a recap of this past Sunday’s awesome hour with (and isn’t this fitting – given all this posting mystery?) 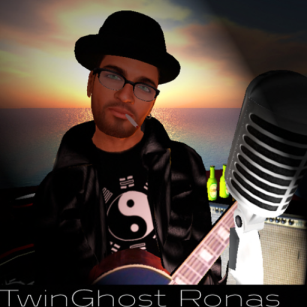 the incredible TwinGhost Ronas! As he opens his set, you can’t help but notice how cool and casual TwinGhost is – how deeply soothing and at peace. He is comfortable in his own skin, and that feeling is contagious. It is as if he accepts us – his collective audience – and invites us to step up on the porch and sit back with a cool drink in the summer heat. And then, he begins, and we are transported to that very time, that very place. And we love it. He greets us all – one by one – as he wends his way through his set. It seems apparent that he chooses the songs as they come to him, as the mood suits. Perfect! Every. Single. Time. This night, he expressed a desire to play cover songs. We love his original music, but when TwinGhost does a cover, it becomes his song. This is true of several Ce Soir musicians; it’s just the way of it, and TG is certainly no exception in that regard. And so, on he went, giving us a taste of some of the best music ever written. He sang and played and we loved every note of it – dancing and swaying our way through the hour. He has such a way with his guitar, and that amazing voice carries so much with it as it lifts and swirls through the air. Still relaxing on the porch, we moved into high gear as the evening moved on. Each song took us higher…and higher. I, myself, was moved to float above the bridge – needing to literally be off-the-ground as a way to express the sense of flight I was feeling. At a certain point, TwinGhost moved into originals mode, and we went right along with him. As I almost always do, I began hoping, hoping, hoping that he would sing Live Again as a closer. I can’t help it! I just LOVE that song! It speaks to me, moves me…and I am not alone. As he prepared to end the night, he spoke those magic words, “There are many directions I could go now…but only one seems just right.” Oh, yeah! And it was just as it should be. That music leaves me speechless; it’s about eternal love, and I know it’s true. As he sang, it was another one of those pinnacle moments when everything is right; TwinGhost’s music, his voice, those lyrics he has penned – perfect to the very last note. As he dropped the stream, you could just feel the calm. People lingered to dance on, and the night deepened. It. Was. Wonderful. We can’t wait til next time (22 April at 6 PM, here at Ce Soir)…so we’ll be seeing you somewhere on the grid, soon, TwinGhost! Thank you…! Next Wednesday! JooZz Magic and Ex-FM Radio: TODAY at Ce Soir!